The Auckland All Ford Day (AAFD) has been a part of the local motoring culture for the past decade, during which time the event has grown to draw attendances of 400+ fine examples of the Blue Oval’s Fine Family of Fords. The AAFD is an annual event that is usually held on the first Sunday of every April (except when Easter falls that weekend). It is an event where Ford enthusiasts from all around the country come to show off their Ford vehicles for the day and have the opportunity to win an array of fantastic prizes. The event is open to the general public and is aimed to be a fun family day out, providing a plethora of activities to keep people of all ages occupied for hours. This event has grown from humble beginnings as a club showday to an event that is growing substantially year on year as it starts to become a “must-do” occasion on all vehicle enthusiasts calendars. The 2008 AAFD held at Eden Park in Mt Eden saw over 400 Ford vehicles participate, over 500 vehicles showed up to our larger 2009 event held in Albany at North Harbour Stadium, and with registrations continuing to roll in, we are confident that the 2010 event will be even bigger again! We have even spoken to our good friends at North Harbour Stadium to ensure we have more car parks available! The AAFD is a not-for-profit event, run by a committe of passionate Blue Oval supporters from Auckland Ford Clubs and Ford Dealerships. Every year the event committee choose a charity to support, to which a large proportion of the profit proceeds made on the day are donated. The remaining profits are split between the five founding clubs: the FPV & Tickford Owners Club, Falcon GT Club, Anglia Car Club, Ford RS Owners Club and the Auckland Mustang Owners Club. You can expect to see vehicles at the All Ford Day that are not generally on public display such as Mustangs, GT Falcons, Cosworth-enhanced Fords, Anglias, Escorts, Cortinas, Zephyrs, Zodiacs and early Fords such as the Model T and the Model A, right through to the 2008 NZ Car of the Year, FG Falcon, and the AMI Car of the Year, the FPV F6. The All Ford Day is not all about cars though - as well as many car displays there are other attractions for the whole family ranging from bouncy castles, ice-cream and coffee karts, to wheel-changing challenges, V8 racecar simulators and chainsaws, as well as many fantastic trade displays for you to browse. Vehicle entries can be registered online, but are mainly made on the day. The north stand car park gates (entrance off Appian Way) are open for vehicle entrants early in the morning. In order to ensure that this event continues to grow and prosper, we will once again take steps to obtain category sponsorship and trade exhibitors for the 2010 event. If you are interested in this opportunity please visit our Sponsors page. One of the big draw cards of the 2009 event, was the Major Sponsors prize. The Auckland Ford Dealerships put their competitive gloves aside for the day and teamed up to offer two return tickets to Melbourne where the winners were treated to a VIP tour of the FPV factory to see how the modern day Fords are built and also an exclusive look at the brilliant Ford Discovery Centre! What will be up for grabs in 2010?! Be sure to come along and find out. We value your opinion as Ford supporters so if you have any suggestions for what you would like to see at the 2010 All Ford Day, please contact us and tell usl We'd love to hear form you. 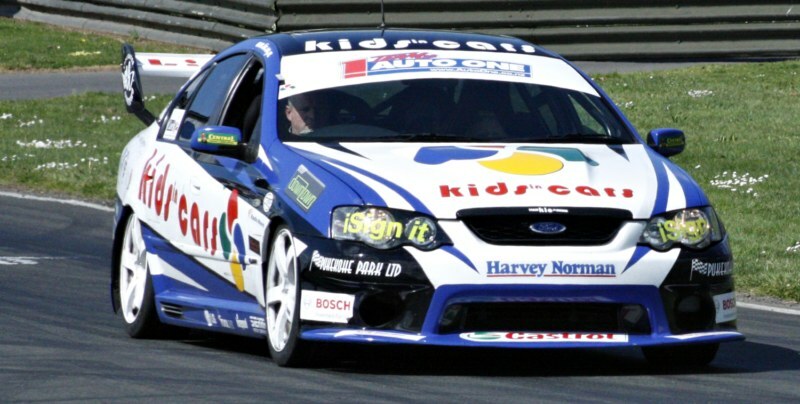 Look'n FORD to our tenth birthday and the 2010 event at North Harbour Stadium! Thank you for your support for the AAFD. Look’n FORD to it.